Our product range includes a wide range of rpvc single screw extruder conduit rpvc trunking plant and single screw pipe plant. 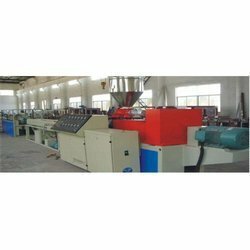 Our firm specializes in offering a distinct collection of RPVC Single Screw Extruder Conduit RPVC Trunking Making. This exclusive range finds its wide application for tube well casing, industrial waste and chemical drain and domestic plumbing. To maintain defined quality standards, our skilled professionals manufacture the offered range by making use of the latest technology and high grade components. Moreover, it is thoroughly examined by our quality analysts against various quality parameters.